“You’re not supposed to be here,” the man said. I glanced around the basement hallway. “But this is the address on my map,” I said, waving my Bucky map. My quest for Bucky started by accident. 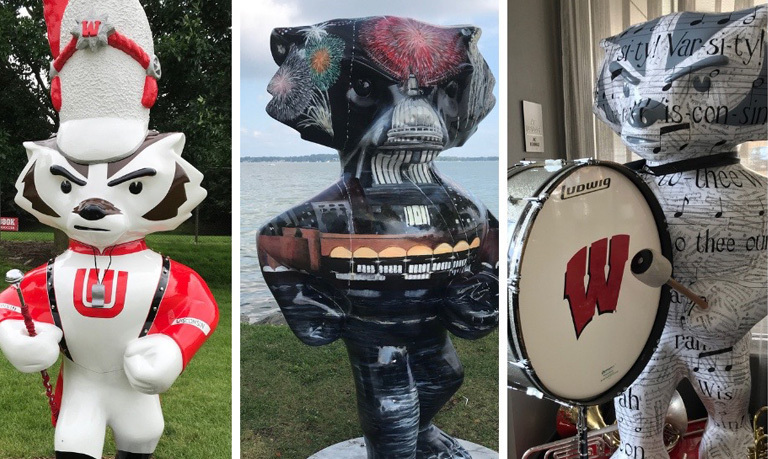 To avoid a traffic jam, I detoured onto Observatory Drive and discovered a UW mascot, Bucky the Badger, overlooking Lake Mendota. I swung over and examined the Bucky titled “Celestial Bucky” painted with glow-in-the-dark celestial bodies. 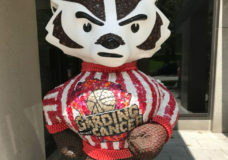 I continued to UW Health to give a presentation to medical students and discovered “Dream Bucky” plastered with drawings created by the children at The American Family Children’s Hospital representing their hopes and dreams. 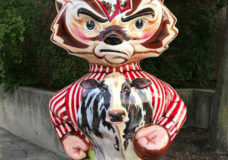 I had inadvertently stumbled across Bucky On Parade, a total of 85 Buckys created by various local artists. For four months the Buckys would be displayed around the city and then auctioned off for charity. 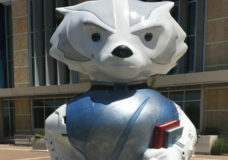 My car now automatically diverted to Bucky sightings. I had caught the Bucky bug. Rain pelted my umbrella as I hoofed down the path toward another obscurely placed Bucky. 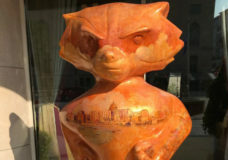 In my Bucky quest, I exchanged cameras with visitors, met three young ladies from Poland and waylaid strangers, asking them, “Where is Bucky?” I tossed a bill into the guitar case of a street musician singing his off-key ditties and crashed an outdoor dancing event at the Monona Terrace. I drove on what were probably foot paths, plugged greedy meters, dodged tickets in permit-only lots, parked in a “No Idling” zone, and beneath a “No Parking, Police Order” sign, my flashers blazing. I circled the Capitol, trekked through campus and climbed stairs equivalent to a stair-stepper workout. A Fitbit would have logged a record number of steps. I trolled Facebook, elicited phone support, dodged raindrops, slogged through mud puddles and swatted mosquitoes. I was even expelled from a building. Through many detours, I ferreted out the covert Buckys tucked away from public view until I succeeded in locating all 85 Buckys on Parade.